The VFW presented Lassen Crime Stoppers, represented by President Jeremy Couso and Board Member Jim Uptegrove with a check for $250 dollars to further Crime Stoppers’ mission to deter local crime. Over the last three years Susanville’s Veterans of Foreign Wars Post #2381 has continuously made monetary contributions to local charitable organizations, totaling up to an astounding $19,704 that the group has put right back into the community through a wide range of causes including large donations to Sober Graduation, Susanville Little League, Lassen Crime Stoppers, Northern California Cancer Advocates, Susanville Police Officer’s Association’s Holiday with a Hero and more. The list is both extensive and impressive. The VFW has also hosted fundraisers for other organizations, helped pay for scholarship programs, Eagle Scout projects and a relief fund for local veterans. 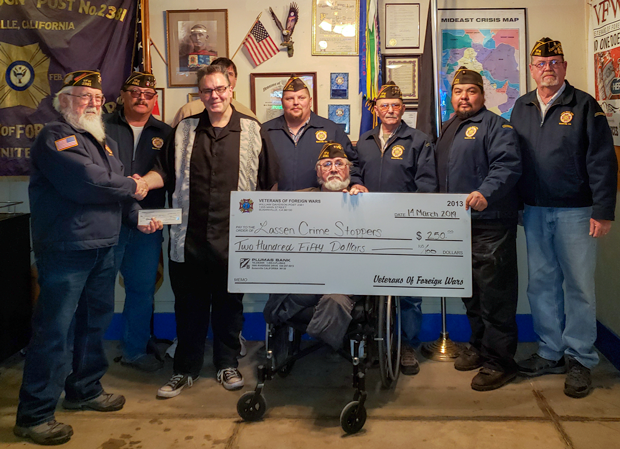 This month alone the VFW donated $250 to Lassen Crime Stoppers, $250 to Northern California Cancer Advocates and $250 to Susanville Little League. 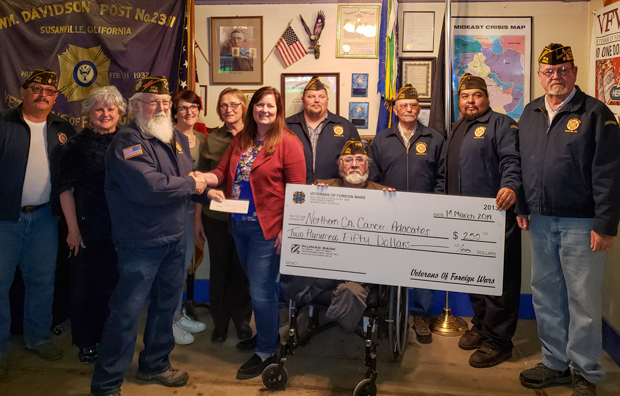 Last Thursday the VFW donated $250 to Northern California Cancer Advocates represented by Shirley Bowden, Emily Bare, Connie Herman, Shelley Bennett. What wonderful blessings for our community! Thank you VFW!